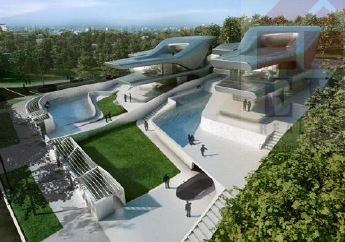 d'Leedon Condo is designed by Zaha Hadid. It features 7 iconic, 36-storey towers. d'Leedon is near Farrer Road MRT. d'Leedon has 1703 units. The chief architect for d'Leedon, Zaha Hadid suffered a sudden heart attack while being treated in the hospital for bronchitis contracted earlier in the week. The futurist architect died on Thursday, 31 Apr. 2016.
d’Leedon sits on an expansive 840,049 sq ft plot of land along Farrer Road. Designed by Zaha Hadid, the landmark 99-year leasehold project features 1703 residential units of 1 bedroom + study, 2 bedroom, 3 bedroom, 4 bedroom apartments, penthouses, and 3-storey garden homes. An additional 12 units of strata semi-detached houses add the joy of living in landed homes amidst its condo grounds. 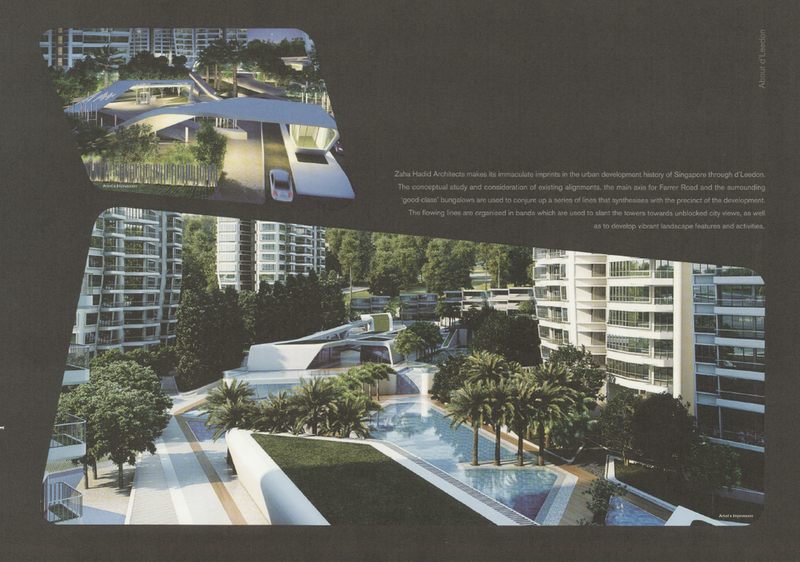 Art In Living, Living In Art is the design concept of Zaha Hadid's d’Leedon. Her signature style of flowing lines and sensuous architectural silhouettes helps bring out the best in the iconic project. Indeed, d'Leedon induces awe. 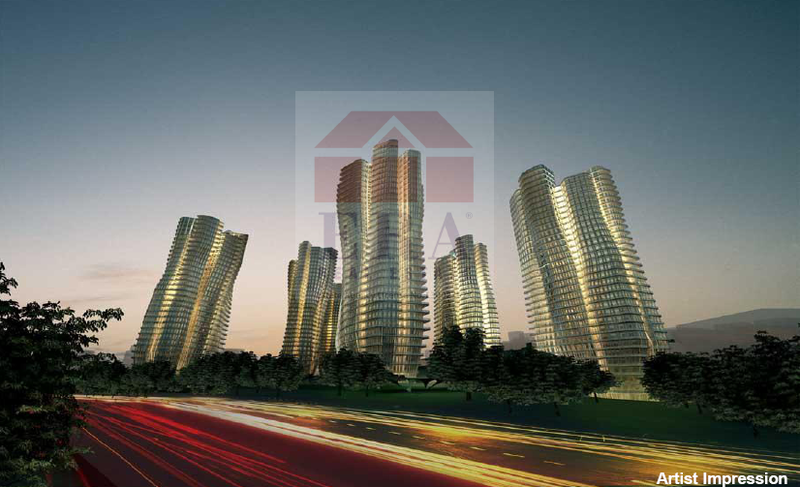 It is the one and only high rise 36-storey residential development in the precinct. Its prominence outshines any other in the area and inspires admiration. People look up to it. 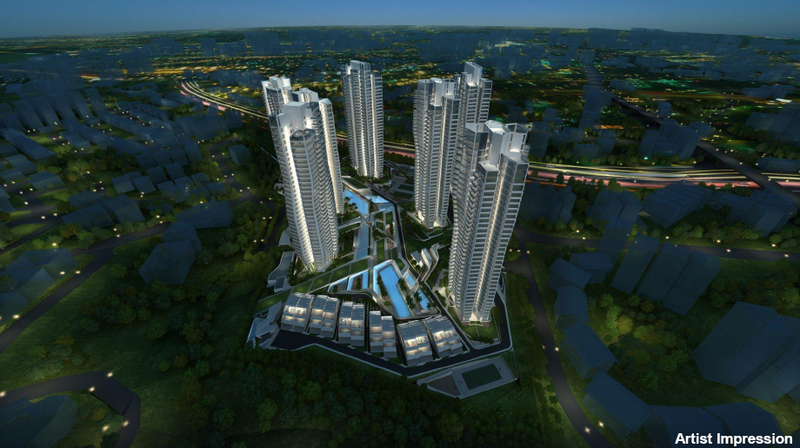 Framing a marvellous impression of 7 towers that escalate to the sky, d'leedon offers a panoramic view of Singapore. Away from urban clutter, d'Leedon is the landmark that offers the luxury of space, with breathtaking scenery of Botanic Gardens and Bukit Timah Nature Reserve. 2014 Risky Year For World Property Markets? 'Tipping point' year for property? Star Architects – Living and visions articulated by Zaha Hadid (d'Leedon), Moshie Safdie (Sky Habitat) and Office for Metropolitan Architecture (OMA), The Interlace. They each tell a narrative of the Singapore landscape and create a connection for the people who will inhabit them. The sprawling landscape with its tranquil settings and picturesque views is a killer combo that is in short supply in our land-scarce city. It offers unobstructed views of Bukit Timah Hill, Botanical Gardens, Mac Ritchie Reservoir and the city skyline of Orchard Road. It is fringed by Good Class Bungalows and private residential enclaves. A substantial land area is dedicated to facilities and landscaping with the residential blocks only taking up about 20 percent land area. It is ideal for own stay or for investment. 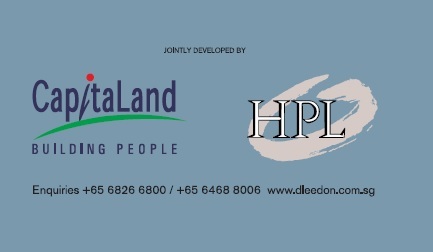 d’Leedon is strategically located in the popular Holland / Bukit Timah precinct. Farrer Road MRT is a short walk away from the d'Leedon project. Holland Village, Botanic Garden and Tanglin is 5 minutes by car from the condo. A 10 minute drive will take you to Orchard Road and Dempsey Hill, the vibrant shopping, dining and lifestyle locales. 20 minutes to CBD and integrated resorts. RIBA Stirling Prize – 2011. ‘'Coco Chanel of today' and 'the greatest living architect'. Messner Mountain Museum, Corones, Italy. Hadid projected a daredevil-spirit into her design of the museum project, allowing visitors to peer over the edge of Mount Kronplatz. Completed July 2015. Eli and Edythe Broad Art Museum, East Lansing, Michigan. Vitra Fire Station, Weil am Rhein, Germany. Lois & Richard Rosenthal Center for Contemporary Art, Cincinnati, Ohio. Dongdaemun Design Plaza, Seoul, South Korea. Glasgow Riverside Museum of Transport, Glasgow, U.K.
MAXXI: Museum of XXI Century Arts, Rome. Heydar Aliyev Centre, Baku, Azerbaijan. Phaeno Science Center, Wolfsburg, Germany. Zaha Hadid, widely deemed to be the most famous female architect in the world, left behind a stream of unrivalled achievements through her love for art and architecture. From her gravity-defying and surreal architecture in Italy's cliff-hanging museum to the London Aquatics Center in the UK, glimpses of her genius has never failed to impress. Hadid, the Iraqi-British architect was the first woman to be notably awarded the Pritzker Architecture Prize in 2004. Her life work spanned thirty over years of exploration and research in the fields of urbanism, architecture and design. d'Leedon is Zaha Hadid Architects imprint into Singapore urban landscape. Consideration of existing alignments of the Farrer Road axis and the surrounding 'good class' bungalows helped eventually synthesize and slant the towers towards unblocked city views, as well as to develop vibrant landscape features and activities. Currently, the maverick is working on a multitude of projects including: the London Aquatics Centre for the 2012 Olympic Games, High Speed Train Stations in Naples and Durango, the CMA CGM Head Office tower in Marseille, the Fiera di Milano master-plan and tower, Opera Houses in the Middle East and China, as well as major master-planning projects in Beijing, Bilbao, Istanbul, Singapore and the Middle East. 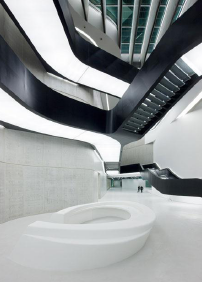 Zaha Hadid's work of the past 30 years was the subject of a critically acclaimed retrospective exhibition at New York's Solomon R. Guggenheim Museum in 2006. The visionary's recently completed projects include the MAXXI in Rome, Nordpark Railway Stations in Innsbruck, the Zaragoza Bridge Pavilion in Spain and the Bumham Pavilion in Chicago. Strategically located in the heart of upbeat District 10, d'Leedon is in close proximity to popular commercial and lifestyle centres such as Dempsey Hill, Holland Village and Orchard Road, as well as highly sought after schools like Hwa Chong Institution and Nanyang Primary School. It is immensely fast to reach the future Farrer Road Circle Line Station and is highly connected to the main routes leading to the city. Boasting full fledged amenities, ace location and myriad facilities, d'Leedon ranks in first and is effortlessly above it all. CapitaLand is committed to a programme of Green buildership, pursuing environmental excellence to develop environmentally-friendly and sustainable properties. In 2012, it was listed among the Global 100 Most Sustainable Corporations in the World by Corporate Knights. In 2011, it garnered the prestigious Asia Pacific Green Builder of the Year Award by Frost & Sullivan. Some recent projects by CapitaLand are Bedok Residences, Latitude, The Interlace, The Nassim, The Orchard Residences, Sky Habitat, The Seafront on Meyer, The Wharf Residence and Urban Resort Condominium. The Property Division of Hotel Properties Ltd has over the years, established itself as a prominent luxury property developer in the Asia Pacific Region. Completed iconic developments include Cuscaden Residence, Nassim Jade and Robertson Blue in Singapore as well as The Met condominium in Bangkok, Thailand. Three current ongoing property developments by HPL in Singapore are Tomlinson Heights and their joint venture projects with CapitaLand, The Interlace and d’Leedon.